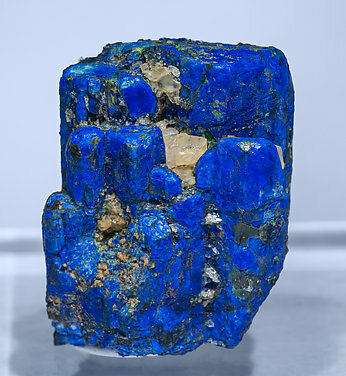 Small and nice single crystal, very sharp and well terminated at its top with the typical intense blue color of this find. Aggregate of elongated Chalcostibite crystals with very good terminal faces, not common on this kind of sample and, in general, with very well defined faces and edges. 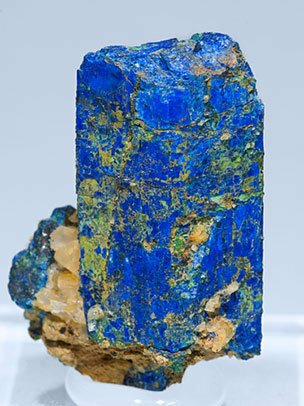 The Chalcostibite is partially replaced by Azurite forming bright surfaces with a very vivid color. 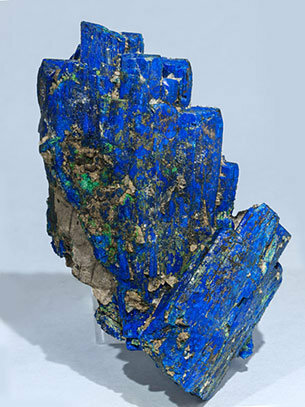 Floater parallel growth of Chalcostibite crystals with excellent terminal faces and superficially substituted by Azurite. The color, the quality and the crystal definition are unusual for the species. 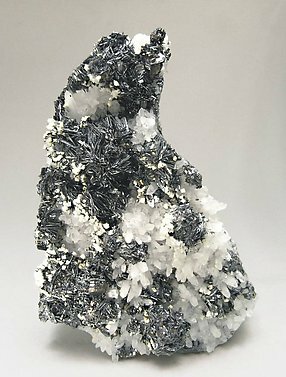 Single Chalcostibite crystal with a flattened prismatic shape, finely striated and with good upper terminal faces. 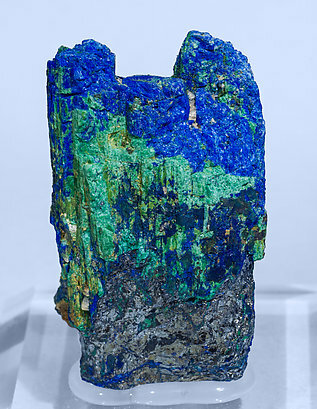 It is on matrix and is coated and partially substituted by Azurite and, to a lesser extent, Malachite. A novelty at Sainte Marie-aux-Mines 2017. 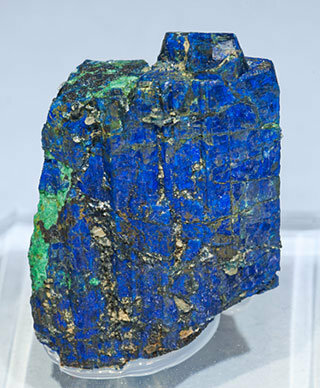 Parallel growth, on matrix, of Chalcostibite crystals with excellent terminal faces, superficially replaced by Azurite and with Malachite impregnations. The quality of the sample and the definition of the crystals are very high and unusual for the species. A novelty at Sainte Marie-aux-Mines 2017. 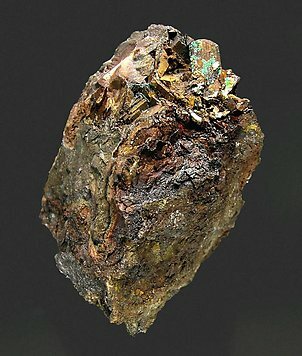 Group of Chalcostibite crystals, some of them with parallel growths, with excellent terminal faces, superficially replaced by Azurite and with Malachite impregnations. The quality of the sample and the definition of the crystals are very high and unusual for the species. A novelty at Sainte Marie-aux-Mines 2017. 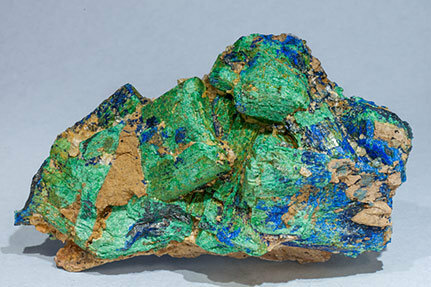 Group of Chalcostibite crystals on matrix, some of them doubly terminated, with excellent terminal faces and superficially replaced by Malachite and Azurite. The quality of the sample and the definition of the crystals are very high and unusual for the species. 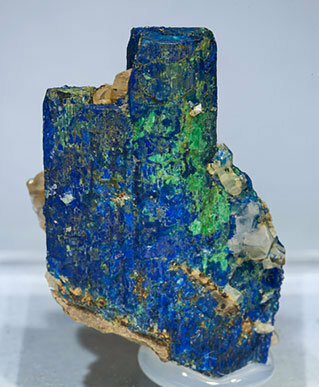 Parallel growth of Chalcostibite crystals with good terminations, superficially substituted by Azurite and with Malachite impregnations. The color, the quality and the crystal definition are unusual for the species. A novelty at Sainte Marie-aux-Mines 2017. 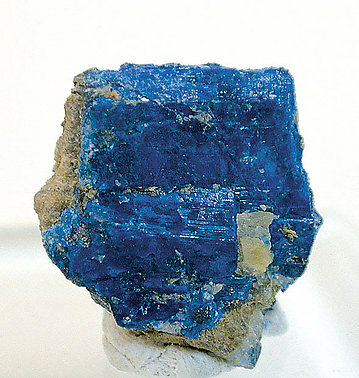 Group, on matrix, of Chalcostibite crystals, some of them partially doubly terminated, with excellent terminal faces and superficially replaced by Malachite and Azurite. The quality of the sample and the definition of the crystals are very high and unusual for the species. A novelty at Sainte Marie-aux-Mines 2017. 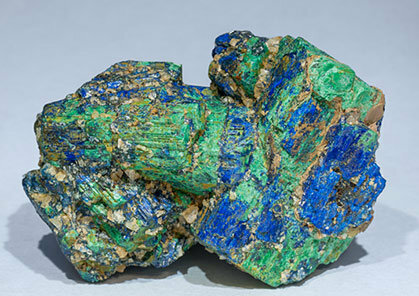 Group of Chalcostibite crystals, some of them forming parallel growths and partially doubly terminated, with excellent terminal faces and superficially replaced by Azurite and small Malachite impregnations. The quality of the sample and the definition of the crystals are very high and unusual for the species. A novelty at Sainte Marie-aux-Mines 2017. Big and elongated Chalcostibite crystals with very good terminal faces, not common on this kind of sample and, in general, with very well defined faces and edges. 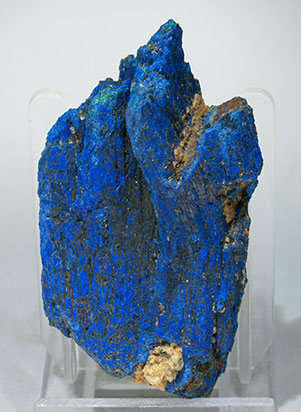 The Chalcostibite is partially replaced by Azurite forming bright surfaces with a very vivid color. This is one of the best samples of the great find in 2017 when Chalcostibites of Rhar el Anz were re-discovered. A novelty at Sainte Marie-aux-Mines 2017. 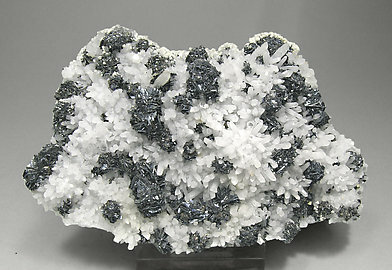 Chalcostibite crystals on matrix, one of them clearly dominant and partially doubly terminated. 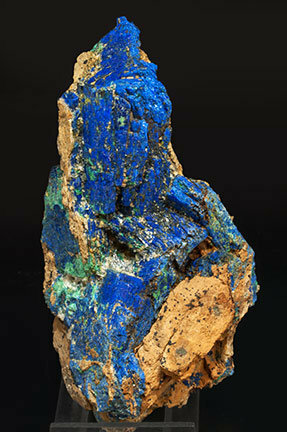 They are superficially replaced by Azurite, which has Malachite impregnations. The quality of the sample and the definition of the crystals are very high and unusual for the species. 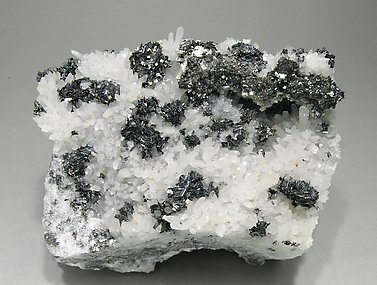 Groups of small flat crystals, very well defined and bright (which is very rare for this species), on white Quartz crystals and small crystals of Dolomite. A rarity for the Boldut Mine, actually closed. Some time ago we did the analysis that we will send to the buyer. Magnificent (for the locality) prismatic crystal of very well defined faces and edges and a very fresh surface with small green alteration. 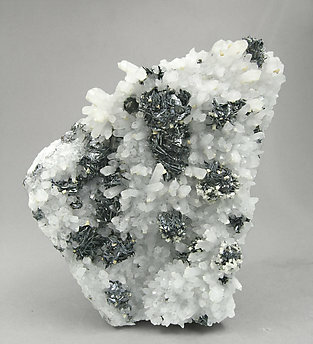 The Crystals occupy the center of a vug on a Siderite matrix, crystallized in some zones.